The new addendum to the 30 March, 2011 military-authored Constitutional Declaration was released late Sunday by the Supreme Council of the Armed Forces (SCAF) in the official state gazette, which publishes any new constitutional or legislative documents when they are issued. - Article 30: In situation that parliament is dissolved the president will be vowed into office in front of High Constitutional Court's General Assembly. - Article 53: The incumbent SCAF members are responsible for deciding on all issues related to the armed forces including appointing its leaders and extending the terms in office of the aforesaid leaders. The current head of the SCAF is to act as commander-in-chief of the armed forces and minister of defense until a new constitution is drafted. - Article 53/1: The president can only declare war after the approval of the SCAF. 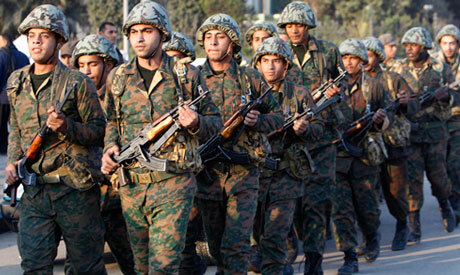 - Article 53/2: If the country faces internal unrest which requires the intervention of the armed forces, the president can issue a decision to commission the armed forces – with the approval of the SCAF - to maintain security and defend public properties. Current Egyptian law stipulates the powers of the armed forces and its authorities in cases where the military can use force, arrest or detain. - Article 56 B: The SCAF will assume the authorities set out in sub-article 1 of Article 56 as written in the 30 March 2011 Constitutional Declaration until a new parliament is elected. - Article 60 B: If the constituent assembly encounters an obstacle that would prevent it from completing its work, the SCAF within a week will form a new constituent assembly- to author a new constitution within three months from the day of the new assembly's formation. The newly drafted constitution will be put forward after 15 days of the day it is completed, for approval by the people through a national referendum. The parliamentary elections will take place one month from the day the new constitution is approved by the national referendum. - Article 60 B1: If the president, the head of SCAF, the prime minister, the Supreme Council of the Judiciary or a fifth of the constituent assembly find that the new constitution contains an article or more which conflict with the revolution's goals and its main principles or which conflict with any principle agreed upon in all of Egypt's former constitutions, any of the aforementioned bodies may demand that the constituent assembly revises this specific article within 15 days. Should the constituent assembly object to revising the contentious article, the article will be referred to the High Constitutional Court (HCC) which will then be obliged to give its verdict within seven days. The HCC's decision is final and will be published in the official gazette within three days from the date of issuance. - Article 38 of the 30 March, 2011 Constitutional Declaration will be replaced with: "The parliamentary elections will be conducted in accordance to the law." Military has no political say so. Anyone who thinks that the military gets to act politically is a moron. That's how autocratic regimes are born. The Model of the US constitution should be the basis. The military has no say so in anything, except to advise the president on military matters. I allways dreamt of such a veto power of the army as in Article 53/1. But the president should have a veto power too..and there may be cases where the army should not say no. sounds suspiciously like one of the most ridiculous and yet hideous hoaxes ever perpetrated-the Protocols of the Elders of Zion . Utter nonsense. LOL -- Iran is not an Arab country and Iranians hate Arabs for imposing Islam on us. What document? Who's Mohammad Goldstein?